Security Check: My TSA can tell you whether to anticipate security delays at the airport and what kind of wait times you can expect when going through security checkpoints. The Status tab shows real-time airport status nationwide. I know that the Las Vegas airport is currently suffering from 30-minute general departure delays, (no) thanks to airport construction. The Can I Bring? tab lets you search for which objects you’re permitted to pack in your carry-on, which must be checked, and which you simply can’t take with you at all. The Guide tab provides plentiful tips for unseasoned passengers: warnings about underwire bras, advice on traveling with children, and more. While the app is well-intentioned, it doesn’t strike me as particularly useful long-term. 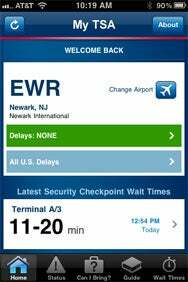 Once you know the latest TSA regulations, having them accessible in app form on your iPhone doesn’t seem that important. The security line delay information could be a hair more useful; generally speaking, though, if you follow airline recommendations about how far in advance of boarding time you should arrive at the airport, you’ll be fine either way. Your fellow passengers and airport staff will help ensure that you don’t miss your flight. Still, if you’re a novice or nervous flier, perhaps the added security blanket of the security administration in your pocket can’t hurt.